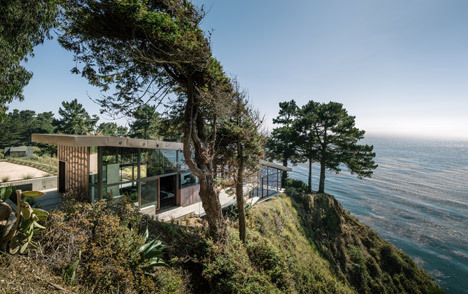 San Francisco office Fougeron Architecture has designed a house in California that steps down the side of a cliff and projects over the edge. 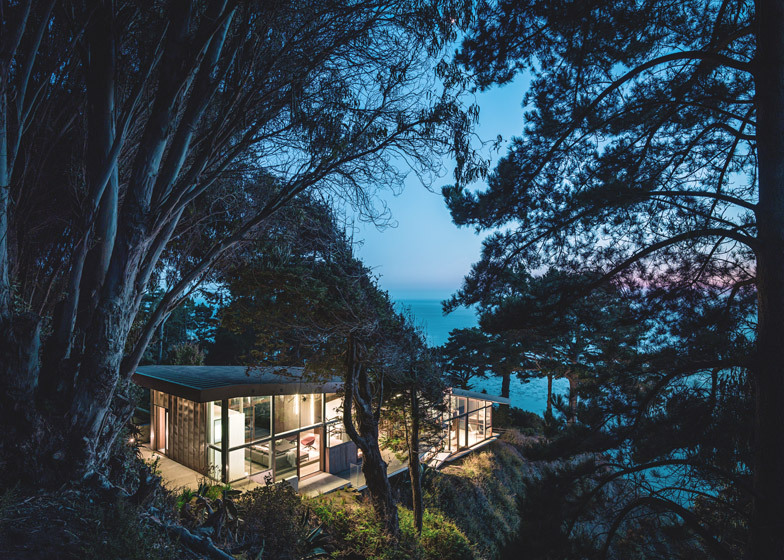 Fall House is perched 76 metres above the Pacific Ocean in California's mountainous Big Sur region, but its exposed location required Fougeron Architecture to design a building with more than just lots of glazing. "Our design strategy embeds the building within the land, creating a structure inseparable from its context," said architect Anne Fougeron. "The site offers dramatic views, yet it demands a form more complex than a giant picture window." 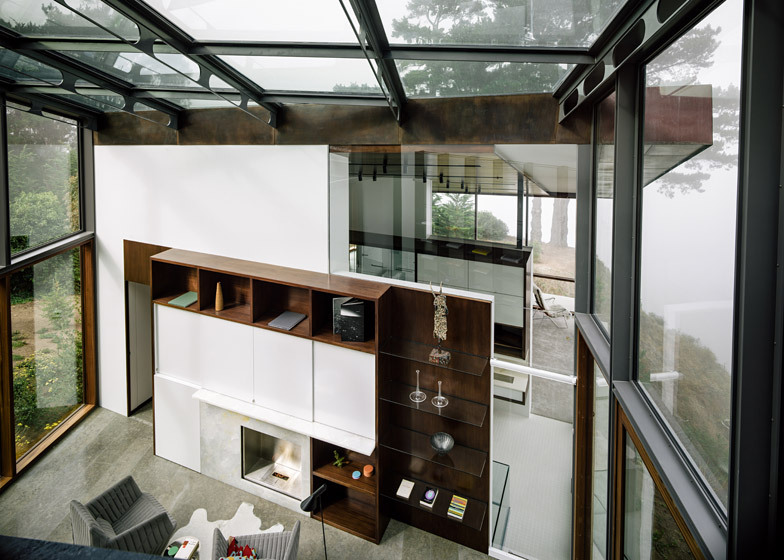 The three-bedroom house features two rectangular boxes, which are connected in the middle by an all-glass library. The open-plan upper box houses the entrance, living space, dining area and kitchen, which are subtly distinguished from each other by level changes in the floor and ceiling. 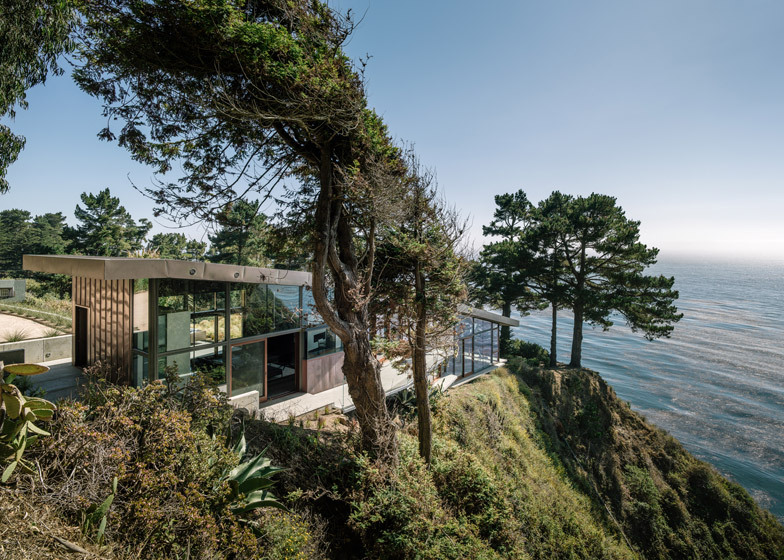 The lower box features two bedrooms and bathrooms, and cantilevers above the cliff's slope, partly to protect the delicate ecosystem on the ground below. 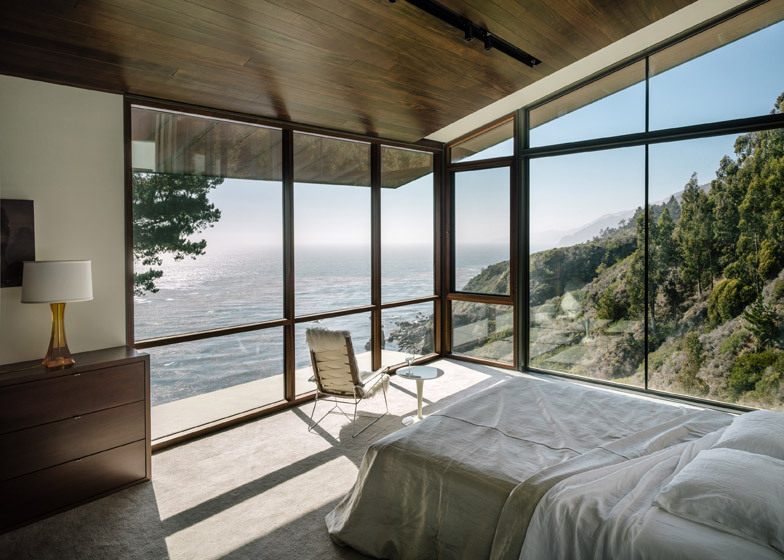 "The lower volume acts as a promontory above the ocean, offering breathtaking views from its floor-to-ceiling windows," said Fougeron. A one-storey concrete wing for the third bedroom has been built perpendicular to the main house, which Fougeron describes as "the boulder locking the house to the land". It has green roof for additional insulation and to give it a more pleasant appearance when viewed from above. The home's glazing has been maximised on the northern side to bring in light and views, and minimised on the southern side to reduce heat-gain from the sun. 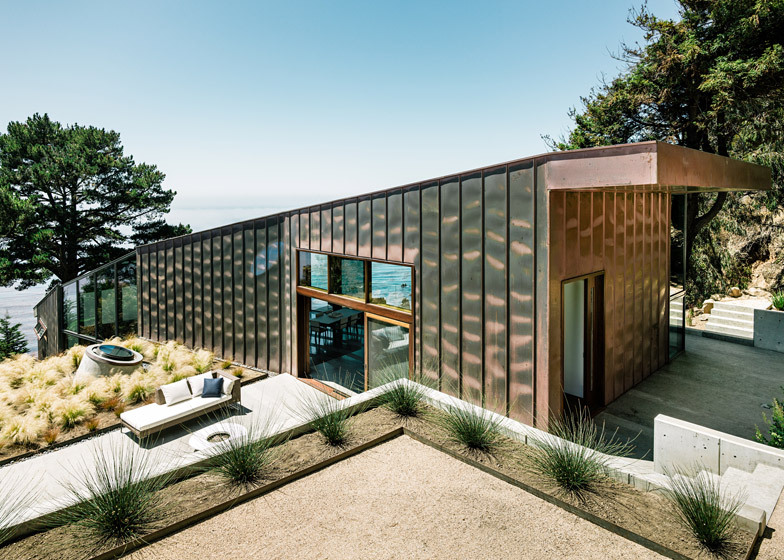 The southern facade, which is wrapped in copper cladding up the wall and over the roof, also features overhangs to protect it from sun and rain. Inside, natural materials such as French limestone flooring and sustainable timber on the walls and ceiling create a visual connection between the house and its natural setting. 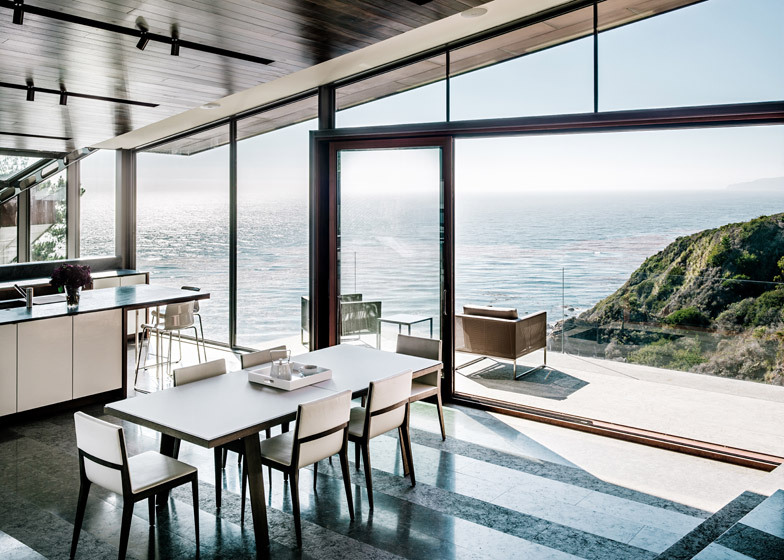 "The interior is a shelter, a refuge in contrast with the roughness and immense scale of the ocean and cliff," said Fougeron. The stepped layout of the building also encourages natural ventilation, with cool fresh air coming in at the lower level, and stale hot air exhausted from the top. To aid this process, automatically controlled glazing at the lower level is coordinated with an exhaust transfer grille at the top level. Placing form on wilderness is a radical act. 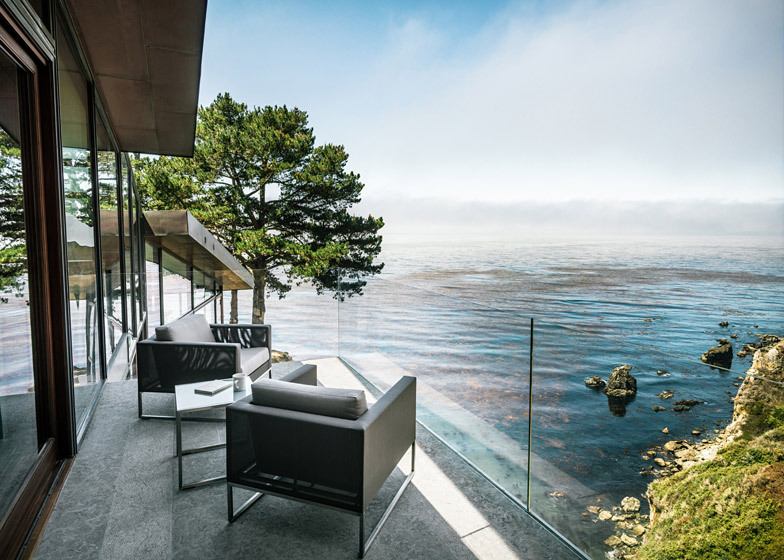 The challenge was to design a house in one of the most spectacular natural settings on the Pacific Coast that would both respect and transform the land. 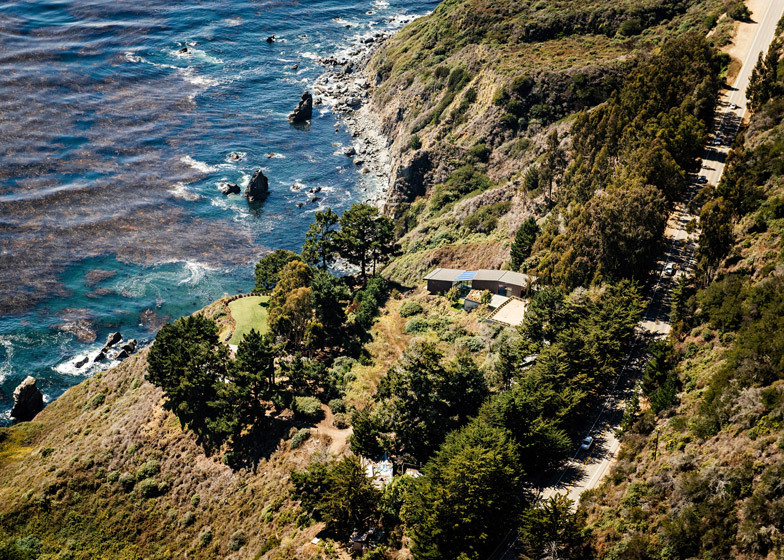 This three-bedroom home, on Big Sur's spectacular south coast, is anchored in the natural beauty and power of this California landscape. Our design strategy embeds the building within the land, creating a structure inseparable from its context. The site offers dramatic views: a 250-foot drop to the Pacific Ocean both along the bluff and the western exposure. Yet it demands a form more complex than a giant picture window. 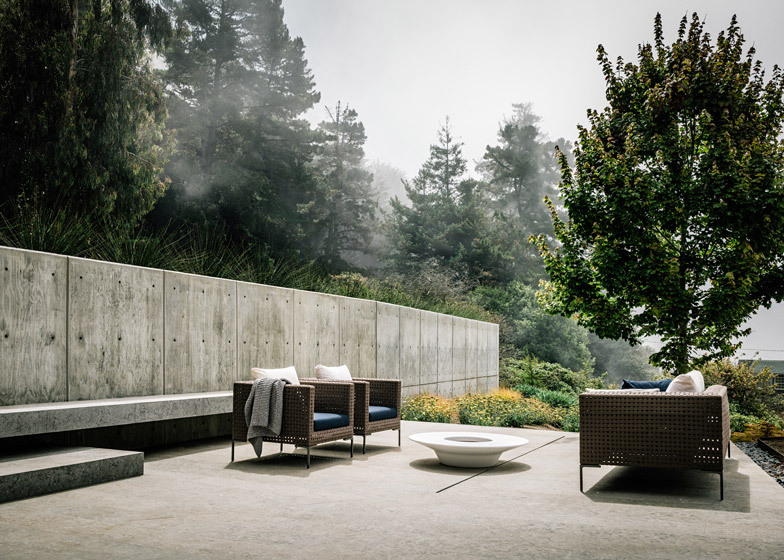 The long, thin volume conforms and deforms to the natural contours of the land and the geometries of the bluff, much like the banana slug native to the region's seaside forests. In this way, the complex structural system applies and defies natural forms to accommodate the siting. 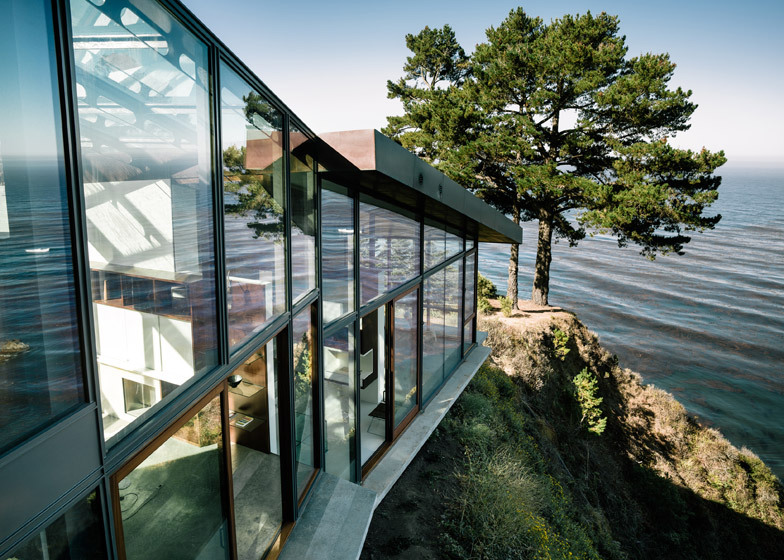 The house is cantilevered 12 feet back from the bluff, both to protect the cliff's delicate ecosystem and to ensure the structure's integrity and safety. The interior is a shelter, a refuge in contrast with the roughness and immense scale of the ocean and cliff. 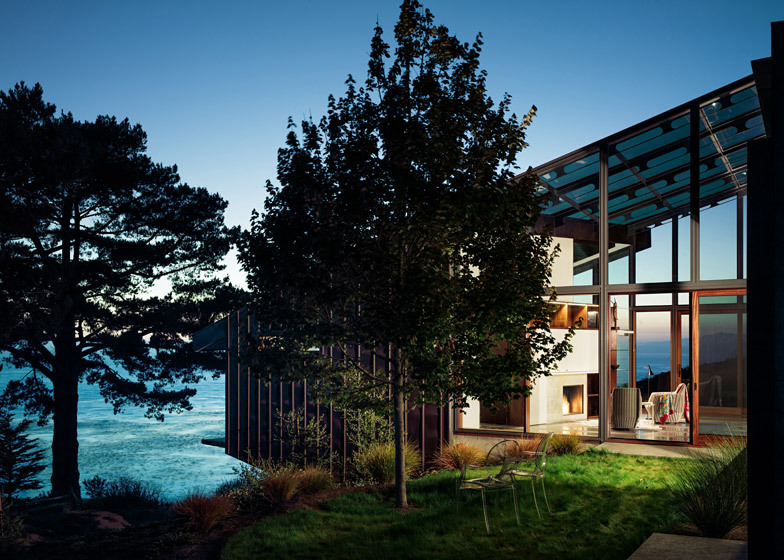 The house also shields the southern outdoor spaces from the powerful winds that blow from the northwest. A one-storey concrete wing perpendicular to the house includes a ground-floor bedroom, building services and a green roof; it is the boulder locking the house to the land. - Low-E, solar-control glazing is insulated and set into a thermally broken custom steel frame. This high-performance glazing reduces solar gain, improves winter comfort, and offers superior thermal performance without sacrificing views. - Radiant hydronic heat eliminates ductwork and allows lower operating temperatures and higher occupant comfort levels. Energy usage is significantly lower and more efficient than traditional forced air systems. - Stack ventilation is naturally facilitated by the building layout. The open floor plan is connected on multiple levels from the lower master bedroom suite to the entry at a higher elevation. Automatically controlled operable glazing at the lowest level is coordinated with an exhaust transfer grille at the highest elevation. The pressure and height differential allows the exhaustion of hot air and intake of cool fresh air. - Drought-resistant and native vegetation is specifically intended to reduce soil erosion and facilitates new habitats for local wildlife. A vegetated roof reduces the aerial visual footprint of the building and provides added thermal mass/insulation for the occupied space below. - On-site wastewater treatment through a septic system paired with efficient plumbing fixtures reduces loads to municipal sewer systems and differentiates black and grey water. Conversely, fresh water is garnered from an on-site stream that is also not dependent on municipal systems. - Low VOC and sustainable finishes were primary considerations to ensure the highest interior air quality and responsible use of finish materials. The interior paint and other interior finishes are all low VOC. Wall and ceiling insulation is formaldehyde-free denim.